Till now I have posted the beauty tips using methi leaves for dandruff and pimples.Now I am going to give you the real and excellent tip with methi seeds water for hair growth.This tip can be easily followed by every boy and girl. Many of the students and employees those who were living outside also can follow this tip very easily. Because this tip especially needs only the methi seeds. If you have a glass of water and spoonful of methi seeds,the thicker hair will be yours.But the main thing is,this tip should be followed regularly. 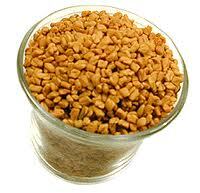 Methi seeds can be used to cure many problems .These methi seeds has different uses for different organs of our body . 1.Many of us feel it as a tough thing of keeping the methi paste to hair,skin.So we dont follow the tip and leave it aside. A glass of methi seeds water gives these many advantages to our entire body.So the intake of these water that was soaked overnight with methi seeds is very important. If you feel it as a tough thing of taking a glass of water daily.Drink this water alternative days in a week. 1.First boil the half glass of water,That sholud be warm.After that take a spoonful of methi seeds and soak these methi seeds in that boiled water at night time. 2.After the seeds getting saoked overnight.In the early morning filter the seeds from that water and drink the water with empty stomach. 3.This should be done daily .If you are unable to do this daily,do this in alternate weeks.